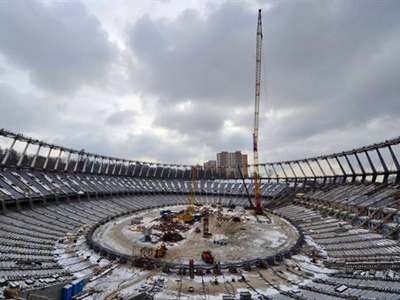 Neo-Nazism, which is deeply-rooted in Ukrainian football fan culture thanks to high-level support from the Orange Revolution leaders from 2004, has become yet another real headache for the country’s current government ahead of Euro 2012. ­­The “beautiful game” turned ugly in the second half of Dynamo Kiev’s game against Karpaty Lvov in the Ukrainian Premier League, as several dozen fans brutally attacked a steward. He was trying to take down banners supporting WWII insurgent army leaders Stepan Bandera and Roman Shukhevich. The victim of football fans’ attack, Andrey Solomatov, says he was simply trying to enforce the law. “I saw the banners and asked the fans to remove them; this violated the law that no political agitation can be used at a football game. They refused and I tried to take them down myself. The next thing I remember is someone hitting me on the head and dozens of feet kicking me on the ground,” he said. Bandera’s and Shukhevich’s status has been one of the main talking points in Ukraine over the past five years. Some in Ukraine see them as freedom-fighters and heroes, others – the majority of the population – call them Nazi collaborators. In the 1940s, they fought alongside the German invaders, killing civilians – Russians, Poles and Jews – without mercy. More than 60 years later, Andrey the steward was nearly killed as well, but he is not sorry about his actions. “Bandera and Shukhevich were murderers and criminals. A football match is no place for Nazism. These banners are being hung by the same people who attacked Red Army veterans in Lvov on May 9 this year,” Solomatov said. 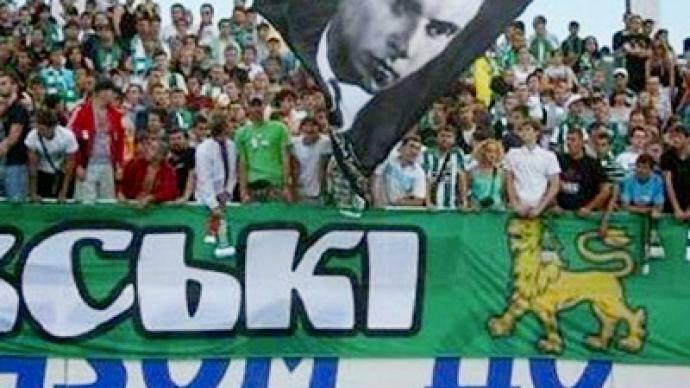 Ukrainian football is no stranger to off-pitch violence and Nazi slogans. The same football fans that clash with the police are often seen in nationalist marches, at times carrying symbols forbidden by football organizations in Europe. Some experts blame the trend on the ideology of the previous administration. ”Ultra-nationalism has radicalized in Ukraine. That’s because for five years it had been strongly supported by the ruling elite. Now ultra-right and neo-Nazi movements are infiltrating football supporters. And nobody does anything about it – neither the authorities, nor the football clubs,” Vladimir Kornilov, political analyst for the CIS Countries Institute, said. The Dynamo Kiev club says it carries no direct responsibility for the incident with Andrey Solomatov. “It’s not forbidden by law to chant slogans like ‘Glory to Ukraine. Glory to heroes. Death to enemies.’ These slogans unite fans in Ukraine. But we will do everything to avoid incidents like this one. Those people are provocateurs and we will oust them from football grounds,” Nikolay Nesenyuk from Dynamo Kiev’s PR department, explained. But such an excuse will not stand-up next year, when Ukraine and Poland co-host the European Football Championship. With the eyes of Europe focused on Kiev, banners commemorating the likes of Bandera and Shukhevich, if still a feature in 2012, could seriously harm the country’s reputation.